In search of a more diverse helping of Indian recipes to get me out of a curry rut I turned to one of my newest cookbooks, From India by Kumar and Suba Mahadevan sees the husband and wife team bring us the secrets from their Sydney restaurants Abhi's and Aki's, you can read more about the cookbook itself here. The name Chicken 65 for a dish amused me enough into cooking it and it's funny little tale of it's origins in Chennai where the name likely arose from the menu number it was presented on seemed pretty likely, even if it is possibly a myth. This recipe was a wonderful departure from the usual Indian curries, not that I have an issue with curry I do love it but I was getting tired of seeing Indian food only presented in one form. I knew there must be more out there. This recipe is super easy and all for a great result in the end, that's what I like. Perfect for a weekday dinner if you start the marinade before you head off for work. If you have mastered the below techniques you have it made and to be honest if you can't do those might be time to head back to your mothers house for some basic cooking lessons. Ensure you don't cut the chicken too small or it may dry out when deep frying. Don't over cook the chicken, 3 minutes is enough. You don't want dry chicken! Including prep time you are looking at around 25-30 minutes. The ingredients are all very easy to find and the techniques basic. Suitable for even newbies to the kitchen. If you are intimidated of deep frying in a wok as the temperature can be hard to regulate and there is always minimal risk of burning down the kitchen then buy a cheap deep fryer from shops like Big W or Harvey Norman. It takes the guess work out of the whole ordeal and is safer if you are fire prone. The recipe suggests the chutney is optional. In my opinion the chutney made the dish, it added a fresh, spicy punch and it was dead easy to make so totally ignore that suggestion. Chicken 65 with green chutney turned out to be like chicken nuggets on steroids. 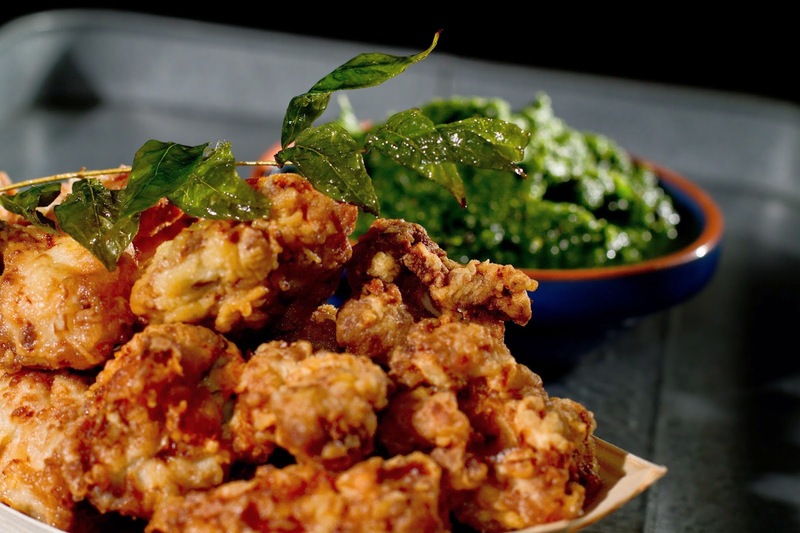 Juicy, moist deep fried chicken pieces with a golden spicy crust accompanied by the chutney brimming with fresh herbs and the kick of green chilli. I highly enjoyed this recipe and the ease to awesome factor was very high.